I am a fan of karinui, those incomplete kimono that require expert tailoring skills to make wearable. Why? 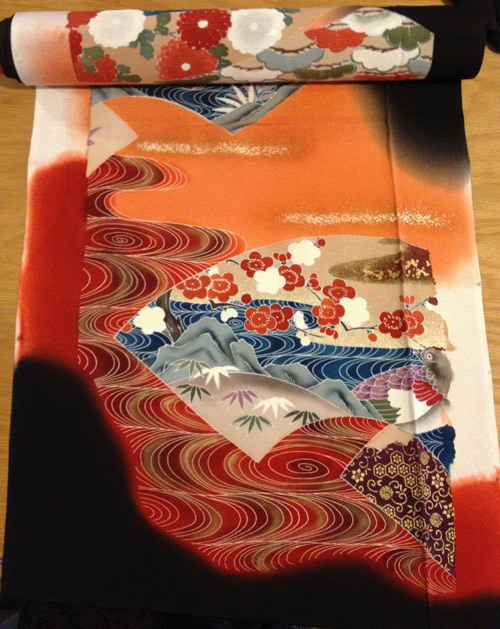 Because when it comes to disassembling a kimono, it doesn’t get any easier than tearing apart basted-together karinui. 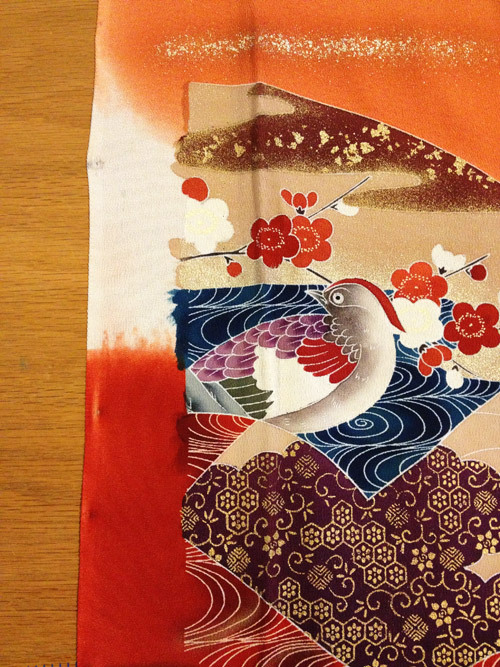 When purchased new, kimono are made to order. 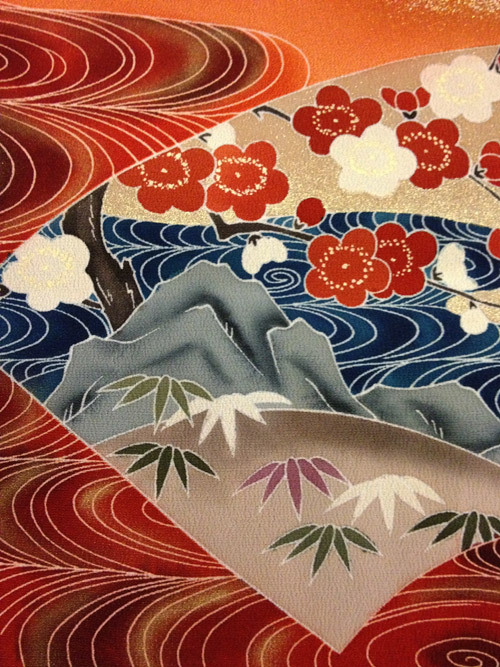 The weave, design, dyes, and family crests (depending on the formality of the kimono) are all taken care of by various craftsmen and craftswomen to the buyer’s specifications. 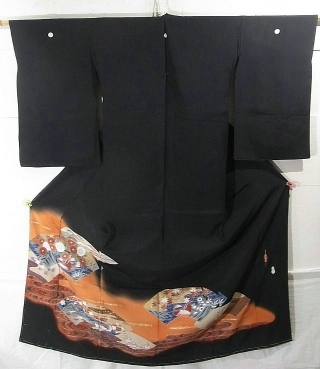 Karinui are kimono that have not been fully tailored, and remain roughly basted into shape with all parts where they need to be so the buyer can try it on for size. Maybe the buyer changed her mind, maybe it was an item a shop had on hand in hopes of a quick sale but it got stale sitting on the shelf. Who knows? The comparison in this series is between two different karinui kurotomesode (high formal women’s kimono). Both are black, both have richly colored designs along the hem, both are reasonably modern. What they differ in is the quality–and the price! The first one was fairly inexpensive, less than $75 including shipping from Japan. The second was more than double that. In taking them both apart, I’ll show you what makes one more valuable over the other. Sure, she’s pretty, looks like she knows what she’s doing, but perhaps underneath all that glamour something is a little… off? 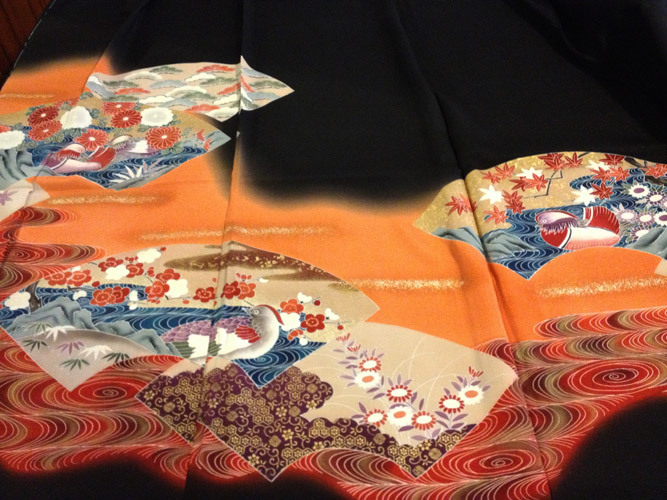 I chose this kimono for the depth of color and vibrant images. It’s not a bad piece, really, and would look lovely worn at a formal occasion. This is a mother-of-the-bride type of formal, which means a woman wouldn’t be wearing it very often. 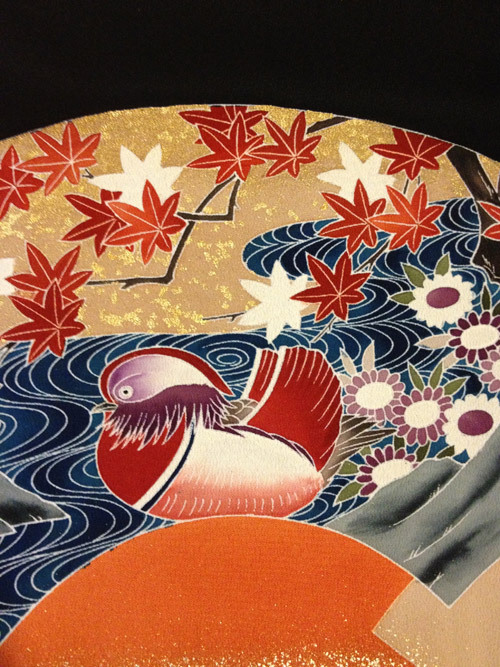 The design shows elegant fans, swirling water with shimmering ripples, and mandarin ducks. Click on any image to get a closer view. Here is the basic layout of the design. In this photo you can see three panels wide, plus the lapel to the far left. The panels are not cleanly lined up yet, as they are only basted. This gives a hint of how much image overlap there is built in to the design. Basting stitches and blank crests. The silk starts out plain white, not black. These circles are carefully reserved during the dye process as the fabric is dipped into vats of black dye or brushed on by hand. The careful application of specific family crests is done by a limited number of small, family run businesses who have been involved in this highly specialized industry for decades, if not centuries. Mandarin ducks are symbolic of fidelity, making them ideal for wedding attire. Maple leaves and chrysanthemums are often seen in an autumn wardrobe, but can hold over into the winter. I like this section so much I added it to the back of some of my business cards! Rocks, branches, bamboo, waves, and plum blossoms. Very wintry, nudging into spring. With the autumn-to-winter images, this kimono could be worn during two seasons, making it more of a bargain than a single-season kimono. Signature of the artist. 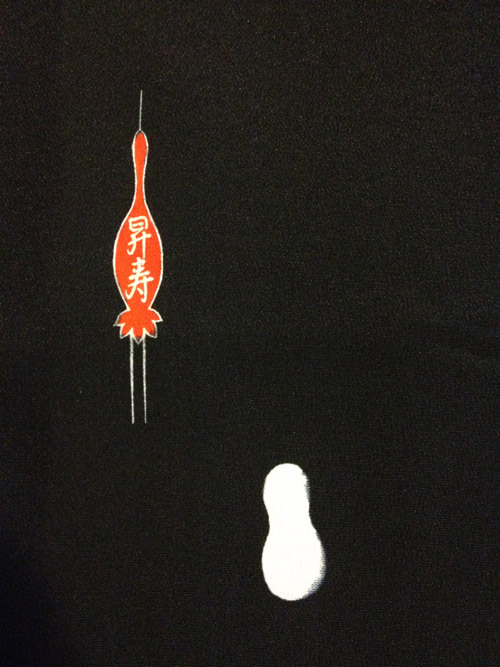 It’s a crane, and the white image below it appears to be a gourd (update: it appears to be a silk cocoon). At any rate, that “gourd” is unfinished, which I suspect means it would be filled in by another craftsperson who had yet to add his or her work. The deconstruction begins! The crease visible down the middle of the image shows where this panel was basted to another. The image runs a few inches beyond that, but not to the selvage. Why all the extra inches where they’ll never be seen? They exist in case the kimono needs to be let out or otherwise altered in the future. Considering the hefty investment of a custom kimono, the owner might very well pass hers down to a daughter, and eventually to a granddaughter. Modifications will need to be made at some point. A taller or wider woman may inherit it, or someone may stain it in an area that can be concealed by adjusting a seam. 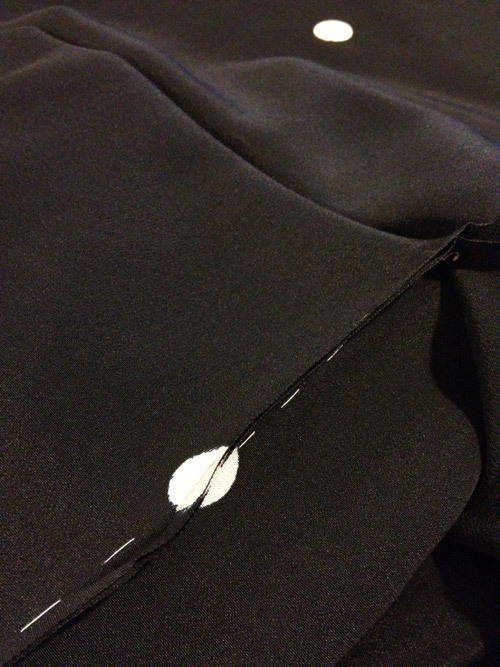 Once the fabric has been completely disassembled, it can be rolled back up to how it was before it was sewn. Here the unfinished edges are more obvious. For a panel that is 14″ (36 cm) wide, only 8″-10″ may be visible. Some of the narrow lapel panels were cut into half-widths, which makes them a little tricky to roll back up without basting together into a full-width panel. 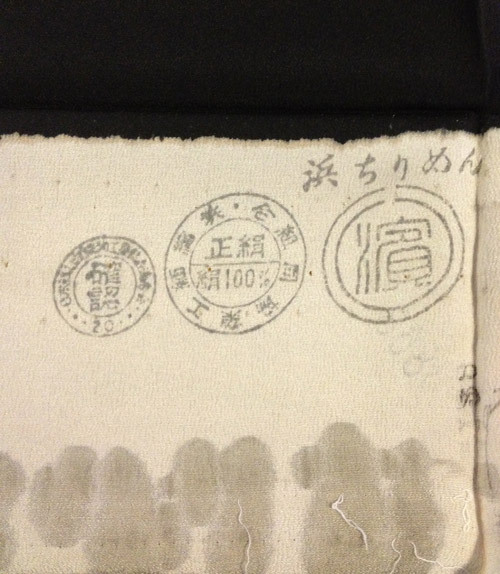 At the end of the bolt, the original white is apparent, along with stamps of the manufacturers and verification that it is 100% silk. They aren’t pretty, but for some reason I save these unartistic bits and bolt ends. 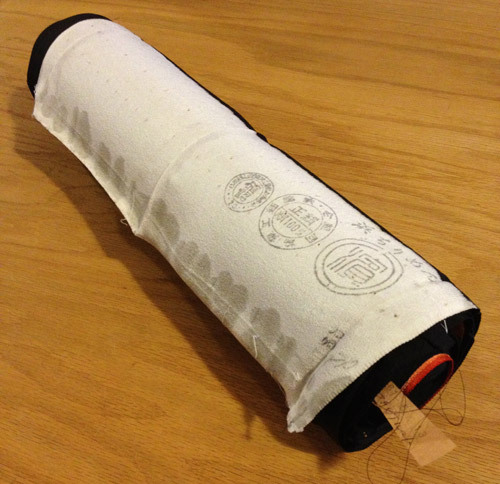 Here it is, all rolled up. An entire kimono! In part 2 of this series, I’ll share the Hot Date and explain what makes her so gorgeous, inside and out.